Note: This cover does NOT fit the Z06. 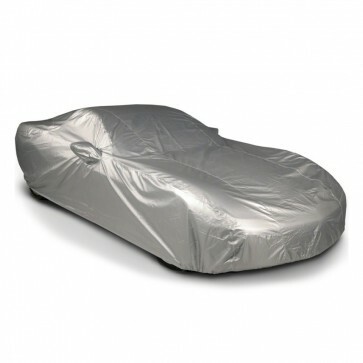 Providing real protection for your investment, custom car covers are precisely engineered to offer the best barrier against sun, moisture and environmental pollutants. Our car covers are finely crafted to deliver a custom fit for your Stingray with the fewest seams possible for a clean look and superior protection. The Silverguard Plus outdoor cover is a 300 denier polyester material with a reflective, water-resistant coating on the outer layer and a soft, non-abrasive layer on the inside. It is a great choice for all-round car cover use, suggested for most conditions (except extreme rain, ice or snow) - in which case, we suggest Stormproof™. The 300 denier is a strong, heavy weave which will not rip or tear easily. The silver coating on Silverguard Plus™ does an excellent job of reflecting sunlight while keeping rain and pollutants from damaging the vehicle finish. Limited 1 year manufacturers warranty.